Fresh calls have been made for the ban on the sale of alcohol at Scottish football matches to be lifted. Strict controls were introduced in 1980 after violent clashes during the Scottish Cup final at Hampden. Celtic chief executive Peter Lawwell has said the club would like to be able to sell alcohol to fans in a controlled environment. However, supporters of the ban say a reintroduction would create problems for police and stewards. The Scottish government said the issue of alcohol at games was one of a range of things it may consider as part of wider work - with the police and football authorities - to explore how to improve the sporting experience for fans. The general sale of alcohol was banned at stadiums in the aftermath of the 1980 Scottish Cup final between Celtic and Rangers, which saw rival fans battling on the field and police on horseback attempting to defuse the trouble. It was largely attributed to the volume of alcohol consumed by spectators. Broadcaster Archie Macpherson, who commentated on the match, told BBC Scotland he thought it was time to bring back alcohol. He said: "I think we have matured greatly since those days. "That was a stunning scene. It was a seminal moment and nobody complained about the new laws that came in after that because things were so bad. "But I think it went too far. If you add all the legislation together about attending a football match, including the recent anti-sectarian ones, I think football fans are being treated like cattle." 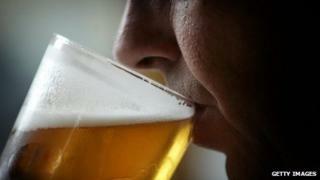 The commentator added: "I think responsible drinking is perfectly possible at football stadiums. People have become much more responsible. Stadia are much better equipped to deal with these things. I think attitudes have changed." However, the former head of the Scottish Police Federation, Les Gray, said the idea of having alcohol on general sale in stadiums "beggars belief". Speaking on BBC Scotland's Call Kaye programme, he said: "I am one of the old guys who was actually around in 1980 when the Criminal Justice (Scotland) Act was introduced to football. "Everybody just keeps blaming this one game but it was a whole host of events that brought about that ban. "We used to stand at the football and get pelted with cans and bottles, which weren't full of their original content, and it was an absolute nightmare." Mr Gray said the controls on the sale of alcohol during games had helped improve the standard at Scottish football "beyond recognition". The ban on alcohol does not apply for events such as concerts when they are held at football grounds. American football, rugby league matches and rugby union club matches are also exempt from controls. In 2007 the Scottish government lifted the ban for international rugby matches at Murrayfield Stadium, allowing fans to drink alcohol while watching games. Mr Gray said: "The atmosphere and the attitude at rugby and ice-hockey are completely different to the football atmosphere." He said talk of "bringing back the bevvy" was an example of football fans' attitudes to alcohol. "Some people just can't get enough," he added. In Scotland, alcohol can only be sold to fans in hospitality and corporate areas during football matches. In England, football fans can buy a drink on the concourses at designated times during and after games, but are not allowed to take alcohol back to their seats. Dev McDonald, from the Scottish football supporters' website Pie and Bovril, said he would like to see a similar model introduced north of the border. "We are talking about controlled, responsible drinking," he said. "People who watch football come from every spectrum of society, and they are no different to the people who go and support rugby or ice hockey. You can't treat them any different. "It is demeaning to actually say that football fans can't be trusted to have a drink." A Scottish government spokesman said: "We are committed to ensuring that football fans can enjoy our national sport in a safe, enjoyable environment. "Decisions are informed by advice from the police, and we are actively working with football authorities, the police and fans' representatives to explore how we can both improve safety and the enjoyment of sporting experience for fans."